Cape Zanpa thrusts out to the west from the middle of Okinawa Island. At the tip of the cape stands a tall white lighthouse, sort of a symbol in its majestic dignity. 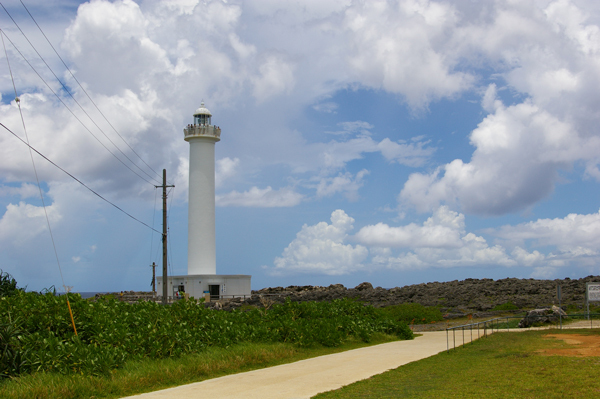 The surrounding area is covered with thickets of Adan (screw pine) trees and the typical coastal vegetation of subtropical Okinawa. The cape is a popular fishing spot and the rocks along the water are usually well populated with fishermen. 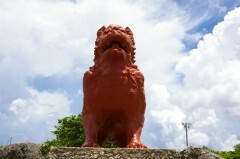 A huge Shisa lion-dog guards the entrance to the Zanpa Misaki Recreation Plaza. Here you’ll find a playground, bicycles, restaurants, shops, barbecue pits and more.